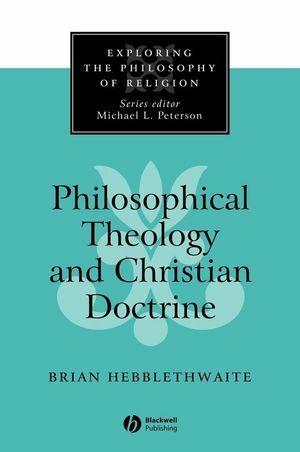 Philosophical Theology and Christian Doctrine surveys and comments on recent work by philosophers of religion in the analytic tradition on the doctrines of the Christian creed. Topics covered include creation, Incarnation, Trinity, salvation and eschatology, and the ultimate future of creation. Brian Hebblethwaite is a Life Fellow of Queens’ College, Cambridge. Among his publications are Evil, Suffering and Religion (revised edition, 2000), The Essence of Christianity (1996) and Ethics and Religion in a Pluralistic Age (1990). 1. Philosophy of Religion and Theology. 7. The Consummation of All Things. 8. Other Themes in Christian Doctrine. A Brief Guide to Further Reading. "At first sight this book seems like a crisp, lucid and illuminating survey of a flourishing field in the philosophy of religion. It is this, and much more. Here is a mind searchingly and relentlessly philosophical, and yet exhibiting a strong awareness of Christian doctrinal tradition. Such is philosophical theology in the best sense." "This unique book sympathetically analyses the incisive work done on theological questions by some recent analytic philosophers. It will become required reading for systematic theologians as well as for philosophers of religion." •Offers incisive commentary on recent work by philosophers concerning the doctrines of Christianity. •Topics covered include creation, Incarnation, Trinity, salvation and eschatology, and the ultimate future of creation.